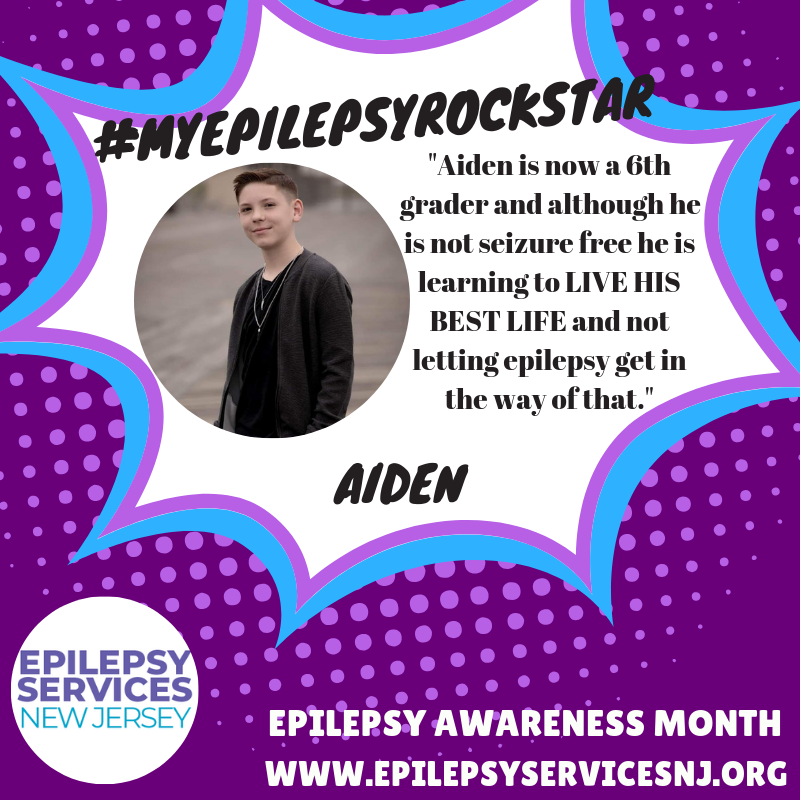 Faith’s #MyEpilepsyRockstar is her son… Aiden! My 12 year old son Aiden was diagnosed with generalized epilepsy at the age of 6 going into his first grade year. When I think about what he has gone through and what he has overcome I can’t help but feel emotional. I think for every parent when their child receives a diagnosis of any kind and it is something you cannot control, take away or protect your child from you cannot help but feel helpless, lost and angry. I know Aiden had his own personal struggles with his diagnosis as well. We were told the list of no’s by his neurologist and he was devastated. No ocean or pools as water above the ankle is dangerous, bathing/ showering unsupervised off limits. No sports of any kind including martial arts as he couldn’t get over heated and too many risks of head injury. No playing on the playground equipment, no theme parks, rides, bikes, scooters, skates, skateboards or video games. To Aiden everything he loved in life was being take from him. He felt like he was being punished for something that was out of his control. Aiden has absence seizures which many know as petit mal. He will have a blank stare or have eye fluttering movements that last anywhere from 5 to 30 seconds. For some people this can happen 5 times a day, 4 times a month or as in Aiden’s case 200 to 300 times a day. Yes, you read that correctly. Aiden has about 200 to 300 absence seizures a day that are 5 seconds or longer, his Epileptologist doesn’t even count the ones that are 4 seconds or shorter because there are just too many to count. I often hear from people when I am talking about epilepsy and very specifically my sons situation, “Oh, so he doesn’t have the bad kind of seizures.” Having a seizure, no matter what type it is out of the 20 different kinds there are, is never good and is always harmful to the brain. Fighting stigmas like this daily is just part of the battle for a person with epilepsy. When Aiden was first diagnosed we struggled to find the right doctor and the right medication for him. He began regressing in school because of the side effects of medication. He went from a highly functioning kindergartener to a first grader who could hardly hold a pencil correctly let alone write. He had behavioral issues and even became suicidal from a few of his meds. For many families this was their experience as well and for others their children responded great to medication. As a family we became desperate to find the right medication and treatment for our son. It took years, but when we met his current Epileptologist we learned a truth that in our hearts we already knew, Aiden has intractable epilepsy. Intractable epilepsy occurs in about 1/3 of people with epilepsy and means that they are unresponsive to the medication and treatment. In the epilepsy world failing 3 medications is a big deal, Aiden failed over triple that. After 4 1/2 years of medications, testing, hospital stays and many conversations with his doctor we decided to pull him off of conventional medications. We and his doctor wanted to try medical marijuana. Now the process for this was long and not easy, which it shouldn’t be for a minor. We needed to make sure this was good for Aiden. While we worked on figuring out the process for that we slowly weaned him off of medication under the supervision of his doctor. Now, I first must say that the medical treatments for epilepsy have come a long way and help many, many people world-wide. I would never diminish the hard work of so many doctors and research. I can only speak to my son’s situation, and that is what I am doing. When Aiden came off of medication it was the summer before 5th grade. I immediately noticed my old smiling little boy coming right back to me. He ate! Boy did he eat!!! The meds that suppressed his appetite and kept him thin and underweight were no longer in his system and he grew leaps and bounds that summer. He felt more energetic, no longer had intense insomnia and was able to have a more positive outlook on his future. Aiden literally took 5th grade by storm that fall. For the first time since first grade he didn’t have a modified schedule and was able to attend school for a full day and make it through! Having a medical IEP he has modified grades and testing, but he was growing and maturing as a student. He was a lead in the school play, joined choir and had a solo. He even began running with the encouragement of his doctor. Aiden had been missing for almost 5 years and he was finally able to be himself again. He has seen amazing results with medical marijuana, his doctor is thrilled with how well he is responding. Aiden is now a 6th grader and although he is not seizure free he is learning to live his best life and not letting epilepsy get in the way of that. He joined cross country this fall and even though he wasn’t the superstar he dreams to become he crossed that finish line each time he ran and improved his time by 4 minutes or so. He is trying out for the school play, joined chorus and hope’s to do be in track and field this spring. Aiden didn’t have an overnight miracle that cured his epilepsy, he just decided it wouldn’t get in his way anymore. For that he is the true definition of an #EpilepsyRockstar and an Epilepsy Warrior.